Verona – A wine lovers delight. Veneto is one of the top regions in Italy for wine production, the area includes 20 DOC Zones and with in the region some of the best known DOC are located around the city of Verona. Bardolino, on the shores of Garda Lake, Valpolicella a little further to the East, and Soave further East still.The regions around Verona and lake Garda produce some of the most sought after wines including the rich and powerful Amarones, fresh and crisp Lugana and Soave whites and easy-going Bardolinos and Valpolicellas. 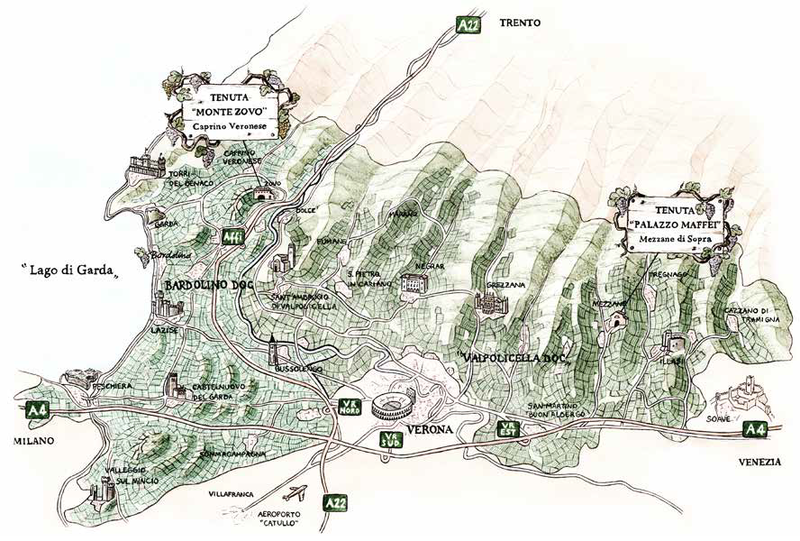 The importance of winemaking in this region can be seen by the creation in 1885 of the very first Italian school for vine growing and oenology. Also, Veneto was the first region to create a strada del vino or “wine road”. This wine-touring road features special road signs providing information on vines and the wines they are destined to become. Our favourite producer in these parts is Monte Zovo, a relatively new winery founded in 2000 but owned by a fourth generation wine grower, the winery has vineyards in Bardolino and Valpolicella where the produce most of their reds from and some small holdings in Lugana to the south of Lake Garda, which they use to produce an excellent Lugana. The are also one of a small number of producers who still make Recioto della Valpolicella, a sweet wine made using the grapes that would be destined for the more expensive Amarone wines. Ca’linverno Rosso Veronese is a unique wine which born from an idea of Diego Cottini, Monte Zovo’s founder. It is the result of a long and exact production, invented more than 20 years ago by the Cottini Family. The grapes; Corvina, Rondinella and Molinara are dried in a two steps divided drying process. The first step is a period of natural drying upon vine, until the middle of November. The second step is drying inside natural conditioned rooms, as in the traditional straw mat method. Twenty-four months of ageing, in French oak barrels, complete the production process of this Rosso Veronese. Balanced, vigorous and complex in its flavours this wine spreads the passion of the Family who created it. Love Ripasso then this is a must try!! A classic able to satisfy the demands of all kinds of wine drinkers. It originates from the noble lands of a centuries-old estate that lies east of Verona and once belonged to the marquises Maffei. Today it is the property of the Cottini family, who carefully select the grapes in the vineyard, scrupulously following a quality control procedure based on low yield and respect for the natural qualities of the grapes and wine obtained from them. After harvesting, the grapes are swiftly fermented so they are able to become a fresh wine with characteristic cherry aromas in harmony with all the taste components of the wine. Monte Zovo Valpolicella is very much one of a kind, a wine able to make any occasion truly unforgettable. Trebbiano di Lugana grapes, which are used to produce the Monte Zovo Lugana are carefully selected in the historical area of Lugana’s DOC following a strict selection process. Monte Zovo’s Lugana is characterized by great balance and quality thanks to the peculiar exposure of its vineyards and thanks to the peculiar characteristics of the ground on which its grapes grow, that is stony and rich. Its flavours and aromas are fresh flowers and citrus and stone fruits. Dry and bold, it is perfect combined with fish and seafood dishes.